Since 1982 our scientists have collected and preserved over 1,500 species of medicinal mushrooms, fifteen special species of which were selected and grown here in the U.S. using proprietary, sanitized liquid-culture techniques to ensure an organic ecosystem that maximizes the medicinal benefits. Our scientists discovered the “non-linear” structure of a mushroom beta glucan that could enhance its natural ability to properly attach to the beta-glucan receptors on the immune cells, hence expedite the front-line immunity activation process to launch a series of innate defense mechanisms in our body. 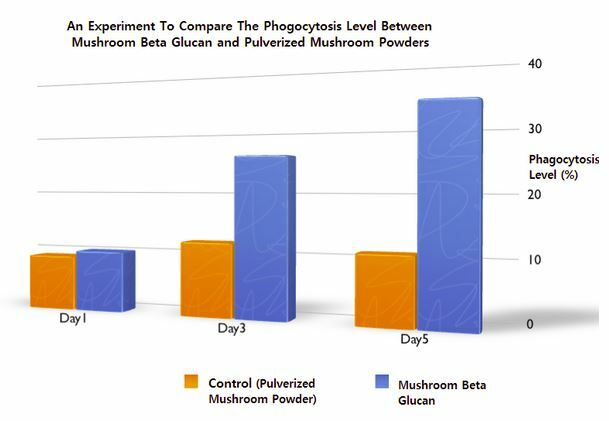 Secondly, the beneficial components including mushroom beta glucan, lectin (immuno-modulatory peptides), mushroom fibrolytic enzymes and other beneficial metabolites extracted from multiple species of mushrooms also play an important role in improving the immune performance and the health-related quality of life during our various field studies. Each mushroom species is tested for toxicity, active linkage and efficacy with in-vivo experiments. These essential scientific procedures are very costly and have rarely been done on most commercially available mushroom products. However, we think this procedure is absolutely necessary because of the additional quality assurance to our mushroom extracts. The proprietary liquid-culture system contains 100% all-natural ingredients, is GMO-free and non-allergenic, 100% organic and free of pollutants. A delicate and patented extraction process is used to eliminate natural occurring impurities and preserves the beta glucan from the medicinal mushrooms. Our proprietary technologies produce beta-glucan from these 15 species of medicinal mushrooms under the most sanitized condition followed by a stringent process of quality control. All products are manufactured under cGMP regulations. cGMP refers to the Current Good Manufacturing Practice regulations enforced by the US Food and Drug Administration (FDA). cGMPs provide for systems that assure proper design, monitoring, and control of manufacturing processes and facilities. Adherence to the cGMP regulations assures the identity, strength, quality, and purity of drug products by requiring that manufacturers of medications adequately control manufacturing operations. This includes establishing strong quality management systems, obtaining appropriate quality raw materials, establishing robust operating procedures, detecting and investigating product quality deviations, and maintaining reliable testing laboratories. This formal system of controls at a pharmaceutical company, if adequately put into practice, helps to prevent instances of contamination, mix-ups, deviations, failures, and errors. This assures that drug products meet their quality standards.